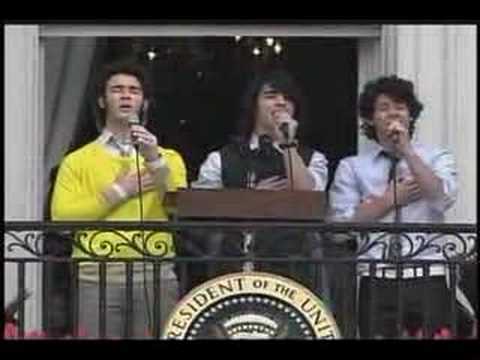 The Jonas Brothers made their first appearance at the White House on Monday, April 9, 2007, during the annual White House Easter Egg Roll where they sang the National Anthem. They returned on Wednesday June 27, 2007, during a Celebrating Women in Sports Tee Ball game on the South Lawn. They sang the National Anthem and after the game, the Jonas Brothers entertained at the picnic-reception with a selection of their hits. The pre-Christian Saxons had a spring goddess Eostre, whose feast was held on the Vernal Equinox, around 21 March. Her animal was the spring hare, and the rebirth of the land in spring was symbolised by the egg. Pope Gregory the Great ordered his missionaries to use old religious sites and festivals and absorb them into Christian rituals where possible. The Christian celebration of the Resurrection of Christ was ideally suited to be merged with the Pagan feast of Eostre and many of the traditions were adopted into the Christian festivities. In England, Germany and other countries children traditionally rolled eggs down hillsides at Easter and it is thought that this may have become symbolic of the rolling away of the rock from Jesus Christ’s tomb before his resurrection. This tradition, along with others such as the Easter Bunny, were taken to the New World by European settlers.